Summary: More than 10,000 students and summer campers visit Martin County’s Environmental Studies Center (ESC) each year. The current sea turtle display has become quite dated. The small tank provides minimal enrichment for the turtle and lacks an adequate water filtration system. The area around the tank is barely large enough to fit a class and wheelchair access for handicapped students is impossible. Lastly, the signage around the tank has become faded and does not provide for a cohesive educational lesson about sea turtles. To remedy these issues the Environmental Studies Council, a not for profit supporting the ESC, is working with school district staff to design a new tank and accompanying educational displays. This project will support the design, construction, and installation of a permanent sea turtle displays to accompany the ESC’s new turtle tank. 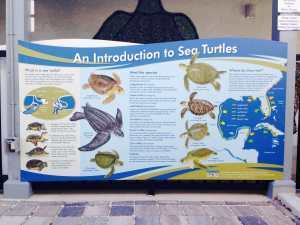 The goal of the display is to educate students not only about sea turtles but how they interact with their environment. The display’s panels will also feature local scientists to encourage students to investigate possible careers in environmental conservation. The new sea turtle displays and tank will enhance each student’s educational experience by incorporating educational signage with the experience of seeing a live sea turtle. The ESC, with its mission to create environmental awareness is perfectly suited to provide a large return on an investment in new displays. The students will be able to learn about sea turtle conservation and carry that message back to their school, home, and community. Results: The Environmental Studies Center’s new sea turtle tank and associated Sea Turtle Education Display, supported by the Sea Turtle Grants Program has made steady progress since the last report. Final approval for the project to begin construction was given by the Martin County School District and construction is set to begin construction in July2014 and end in the fall. The project was delayed until the summer of 2014 so that students could continue to visit the Center during the school year and keep the Center’s summer camps open through the month of June. The education display’s were designed by Dawn Witherington and approved for production. The installed displays have been well received by the Center's staff, students and the public.